The former world 1 is playing at Melbourne Park for the first time since 2017 and a year on from hip surgery but looked laboured taking on his long-time rival under match conditions on Margaret Court Arena. There was very little to be positive about against Djokovic, however. Murray lost his first service game to love and failed to hold serve at all in the opening set, breaking Djokovic once at 3-0. The Serbian was not even playing at full intensity but Murray’s movement around the baseline was simply nowhere near good enough to enable him to go toe-to-toe in rallies like he used to. The limp that has dogged him for 18 months became more pronounced during the second set, with the Scot grimacing at times. 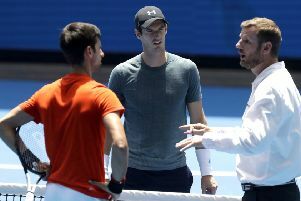 He finally held serve for the first time at 0-3 but, after losing the next game, shook hands with Djokovic. 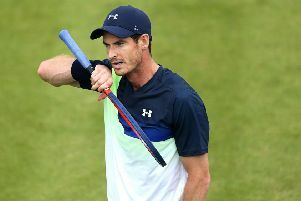 Eighteen-time grand slam singles champion Chris Evert fears for Murray’s future. STRUGGLING: Andy Murray appears to be in discomfort in his practice match against Novak Djokovic of Serbia at Melbourne Park yesterday. Picture: Michael Dodge/Getty Images. “Andy Murray has been one of the best champions as far as good hard work ethics out there,” she said. “I think what is hurting him - because to me, when I watch him, I feel pain - I feel like it’s not the same Andy as two or three years ago. “I think he’ll know in the first three months of the year what his future plans are going to be. I think if he had a bigger serve, kept the rallies shorter, was more aggressive, I think that might make a difference. But his kind of game, it’s very much like Nadal, they’re grinders. I think what is hurting him - because to me, when I watch him, I feel pain - I feel like it’s not the same Andy as two or three years ago.